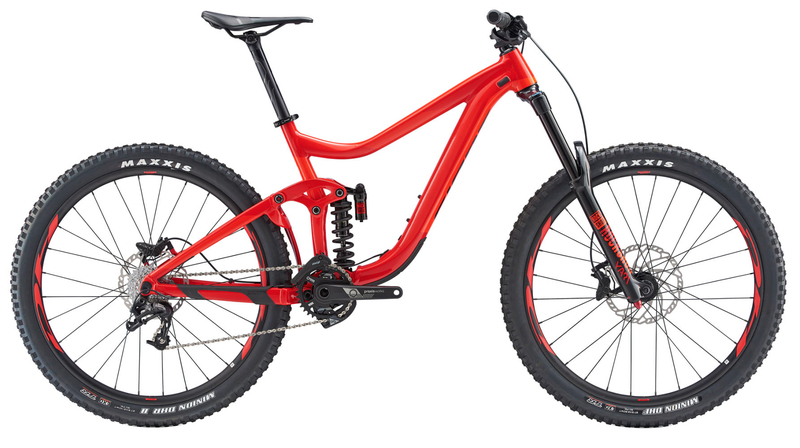 From the bike park to enduro tracks to steep singletrack, this all-mountain bruiser has swagger to spare. The lightweight, super stiff aluminum frame is long and low, and its Maestro suspension helps you float through the rough stuff. The Reign SX 2 features SRAM’s efficient X5 drivetrain that provides you with all the gear needed to mash technical downhills. The RockShox Yari RC suspension fork keeps you in control by smoothing out the trail chatter and sucking up the bigger hits. A Giant wheelset wrapped in Maxxis rubber supply you with all the confidence needed to tackle demanding terrain with authority. When it comes time to slow things down, Shimano hydraulic disc brakes will get you stopped on a dime in any condition. Topped off with a Giant brand cockpit, the Reign SX will have your riding buddies eating your dust. Giant Bicycles are only sold out of our Corona, CA retail store (2410 Wardlow Road, Suite 109, Corona, CA, 92880), or our Riverside Will Call (1615 Eastridge Ave, Riverside, CA 92507). This item cannot be purchased online. If you are interested in a Giant, please contact our Corona Store team at (951) 736-0700, or our Gear Advisors at (888) 880-3811. We are happy to help you arrange a test ride. Are you interested in a Giant model you don’t see on our website? Please let us know - we have access to most Giant models in just 1-2 business days. Thank you for your interest in Giant! Maestro suspension system for improved efficiency. RockShox Yari RC suspension fork with 180mm of travel. SRAM X5 drivetrain is simple and efficient. 27.5 wheels for agility and control. ALUXX SL- grade aluminum frame. with updated geometry.